I’m rather pessimistic about Italy. Simply stated, it’s economy is moribund. If you peruse the OECD’s economic database, you’ll see that both inflation-adjusted GDP and inflation-adjusted private consumption expenditure (in some ways a more accurate measure of actual quality of life) have grown by an average of just slightly over one percent annually this century. And even though Italy’s population growth has been anemic, there are more people. And when you add a larger population to the equation, you get per-capita changes in output and living standards that are even less impressive. But not everyone shares my dour outlook. I recently exchanged views with someone who said that Italy hasn’t increased the burden of government in recent years. And that person is right. Sort of. Here’s a chart showing Italy’s score from Economic Freedom of the World since the start of the 21st century. As you can see, it’s been remarkably stable. But I have two reasons why I think policy stability is a recipe for economic decline. First, you don’t win a race by standing still if others are moving forward. 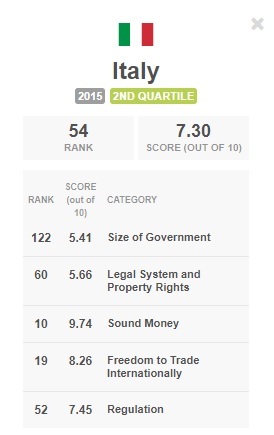 If you look closely at the above chart, you will see that Italy used to be ranked #36 in the world for economic freedom but it now ranks #69. In other words, Italy’s absolute level of economic freedom barely changed over the period, but its relative position declined significantly because other nations engaged in reforms and leapfrogged Italy in the rankings. 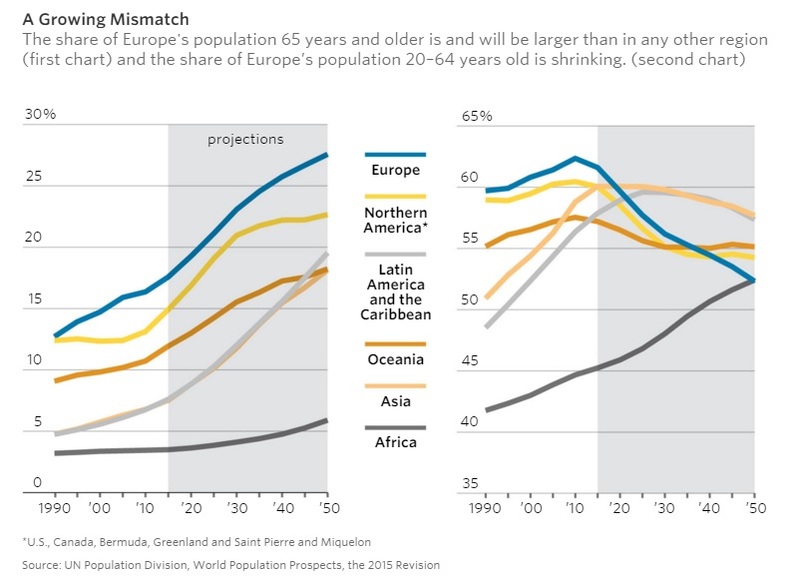 Second, Italy is in the middle of dramatic demographic changes that will have a huge impact on fiscal policy. People are living longer and having fewer children, but Italy’s welfare state was set up on the assumption that there would be lots of working-age taxpayers to finance old-age beneficiaries. In other words, policy stability will lead to fiscal crisis thanks to changes in the composition of the population. Think Greece, but on a bigger scale. And when I refer to Greece on a bigger scale, I’m thinking another fiscal crisis. Demond Lachman of the American Enterprise Institute is pessimistic about Italy and warns that high levels of red ink could cause a big mess. We’ve got an Italian economy that is categorized by extremely high public debt. Their public debt level is now something like 132% of GDP, they’ve got a banking system that is bust, that banks have something like 18% of their loans non-performing, that is a huge amount, the economy is completely sclerotic, that the level of Italian GDP today is pretty much the same as it was some fifteen years ago. There’s been practically no growth, declining living standards… What also makes Italy very important from a global point of view is that we’re now not talking about a small country like Greece which doesn’t have that much systemic significance. We’re talking about the third largest country in the Eurozone. We’re talking about a country that has the world’s third largest sovereign bond market with something like two and a half trillion dollars of debt. And don’t forget that these grim fiscal numbers probably mean even higher taxes on Italy’s young workers. But those taxpayers aren’t captives. Cristina Odone, in a column for CapX, points out that young people are getting the short end of the stick. Gerontocracy, stifling regulations and huge unemployment have hindered Italy’s prosperity for decades now. 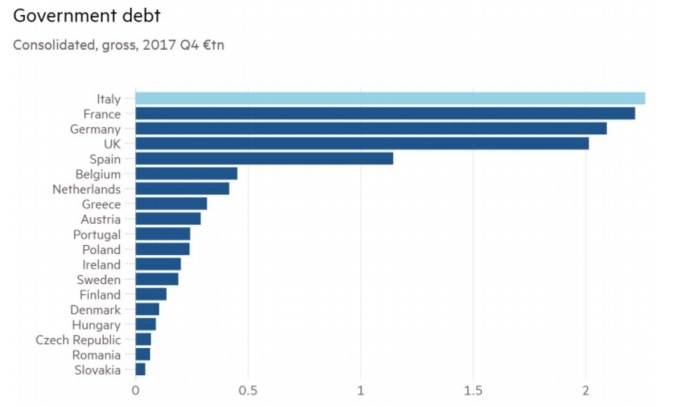 The country hailed for its economic miracle and famed for its creative and industrious entrepreneurs (at the helm, usually, of family-run businesses such as Gucci, Prada, and Ferrero) today comes second only to Greece (among EU countries) for the size of its national debt. …Italy’s unemployed youngsters, who constitute 40 per cent of under-24-year-olds, gnash their teeth at the unfairness of national life, where fossils control the levers of power while flouting their sinecures. A quarter of under-30-year-olds classify as NEETS, young people who are not in education, work or training. Contrast this with the UK, where only one in 10 under the age of 30 is in the same position. …Labour laws continue to blight young people’s prospects. …This sclerosis risks turning Italy into the sick man of Europe. No wonder many young Italians are migrating to nations with more economic opportunity. AFP has a story on the dour outlook in Italy. With the country struggling to kick an economic slump, some 40,000 Italians between 18 and 34 years old set out to seek greener pastures elsewhere in 2015, according to the Migrantes Foundation. “Just talking with people (in Italy) it’s clear going away might be the only solution,” said D’Elia, 26, who has spent the last five years in London, where he currently works as a barman, and intends to stay for now despite high living costs. …most of Italy’s youths are unwilling to return — and the country is seen as offering little to attract foreign graduates. …GDP is forecast to inch up just 1.3 percent this year. The jobless rate hovers at over 11 percent, well above the euro area average of 9.3 percent. Among 15 to 24-year olds it leaps to 37 percent, compared with a European average of 18.7 percent. …Sergio Mello, who set up a start-up in Hong Kong before moving to San Francisco, said Italy “does not offer a fertile environment to develop a competitive business”. …Mello says there are other problems: “The bureaucracy wastes a lot of time”, the red tape “drives you crazy”. Unfortunately, rather than ease up on government burdens so that young people will have some hope for the future, some Italian politicians want new mandates, new spending, new taxes, and new restrictions. And now there’s something equally silly on the regulatory front being proposed by politicians. Here are excerpts from a report by Heat Street on the initiative. Italy could soon become the first Western country to offer paid “menstrual leave” to female workers. …If passed, it would mandate that companies enforce a “menstrual leave” policy and offer three paid days off each month to working women who experience painful periods. …The Italian version of Marie Claire described it as “a standard-bearer of progress and social sustainability.” But the bill also has critics, including women who fear this sort of measure could backfire and end up stigmatizing them. Writing in Donna Moderna, another women’s magazine, Lorenza Pleuteri argued that if women were granted extra paid leave, employers would be even more reluctant to hire women, in a country where women already struggle to integrate the workforce. …Miriam Goi, a feminist writer, …fears that rather than breaking taboos about women’s menstrual cycle, the measure could end up perpetuating the idea that women are more emotional than men and require special treatment. It’s unclear if this policy was actually enacted, but it’s a bad sign that it was even considered. Simply stated, making workers more expensive is not a good way to encourage more job creation. Even a columnist for the New York Times acknowledged that feminist-driven economic policies backfire against women. 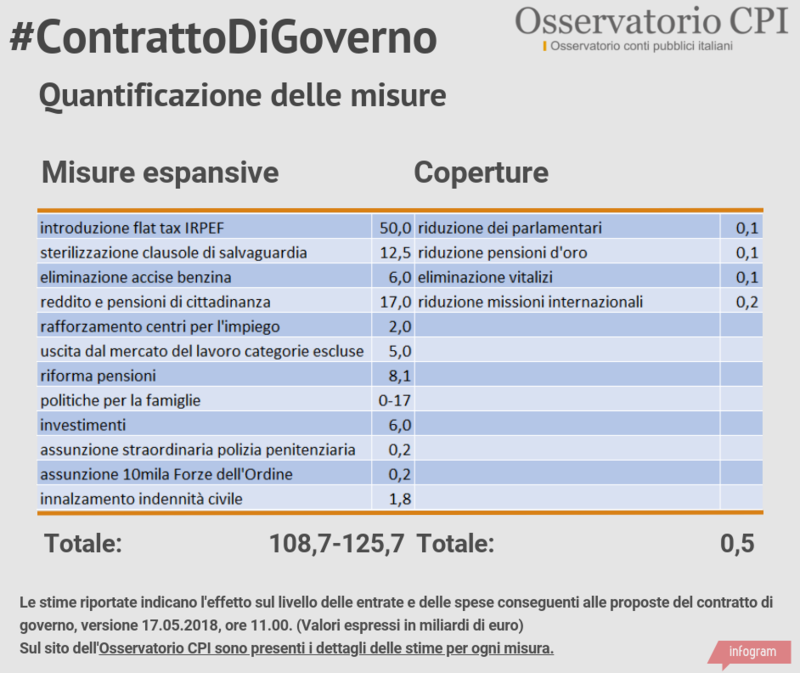 The bottom line is that Italy needs sweeping reductions in the burden of the public sector. Yet the nation’s politicians are more interested in expanding the size and scope of government. Perhaps now it’s easy to understand why I fear the country may have passed the tipping point. You can be in a downward spiral even if policy doesn’t change. Since yesterday’s column was a look back on the good and bad things of 2016, let’s now look forward and speculate about the good and bad things that may happen in 2017. I’m not pretending any of this is a forecast, particularly since economists have a miserable track record in that regard. Instead, the following lists are simply things I hope may happen or fear may happen. We’ll start with the things I want. Reform of healthcare entitlements – Republicans in 2017 will control Congress and the White House, so they’ll have the power to fix our broken entitlement system and dramatically improve America’s long-run outlook. And since the House and Senate GOPers have voted for budgets that presume much-need structural changes to Medicare and Medicaid, that bodes well for reform. The wild card is Donald Trump. He said some rather irresponsible things about entitlements during the campaign, which suggests he will leave policy on autopilot (which is not a good idea when we’re heading for a fiscal iceberg). On the other hand, politicians oftentimes disregard their campaign commitments (remember Obama and “you can keep your doctor“? ), especially when they get in power and finally take a hard look at budget numbers. Perhaps the most optimistic sign is that Trump has appointed Budget Committee Chairman Congressman Tom Price to be Secretary of the Department of Health and Human Services and Congressman Mick Mulvaney to be Director of the Office of Management and Budget. I very much hope Trump seriously addresses the health entitlements. 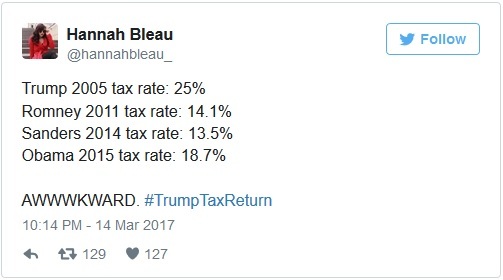 A lower corporate tax rate, “expensing,” and repeal of the death tax – During the campaign, Trump proposed a very large tax cut. With Republicans controlling both ends of Pennsylvania Avenue, some sort of significant tax cut should be feasible. It’s highly unlikely that Trump will get everything he wants, but the three items at the top of my wish list are lowering the corporate tax rate, ending the tax code’s bias against new investment by replacing punitive “depreciation” rules with “expensing,” and repeal of the death tax. Those reforms would have the strongest impact on long-run growth. And the icing on the cake would be a repeal of the state and local tax deduction, which subsidizes high-tax states such as California, Illinois, New York, and New Jersey (I’d also like to see repeal of the healthcare exclusion, but I’m focusing on things that might actually happen in 2017 rather than what’s on my fantasy list). Regulatory reform – The tentacles of the regulatory octopus are stifling the American economy. There’s no single fix for this problem. The overall system for approving regulations should be changed (I will write on the “REINS Act” in a few days), but that’s a partial solution for future red tape. To deal with the existing burden of red tape, a different set of answers will be necessary, including sensible political appointees so that bureaucrats will have a harder time pushing for regulations that are needlessly expensive and misguided and instead will be charged with undoing existing red tape. In some cases (Dodd-Frank, Obamacare, etc), it will be necessary to change current law in order to roll back regulatory excess. Italian default – I’m not hoping for Italy to face a fiscal crisis, but it almost certainly will happen in the near future. The nation’s demographic decline, combined with its bloated welfare state, are a horrible recipe. And while it’s theoretically possible to avert a mess by capping spending and fixing programs (just as it is still possible to fix the mess in Greece), I don’t think good policy is very likely. So Italy will soon face a fiscal crisis and the real question is whether there’s a good response. Ideally, if this happens in 2017, Italy will be allowed to default (presumably because Trump’s representative at the International Monetary Fund vetoes any sort of bailout). This will mean, a) the people and institutions who were silly enough to lend money to a profligate government will suffer losses, making them more prudent in the future, b) Italy will lose the ability to borrow more money, putting an end to additional red ink, c) Italian politicians will be forced to immediately balance the government’s budget, which hopefully means genuine budget cuts, and d) the Italian people will (hopefully) realize that a system based on looting and mooching can no longer be maintained. Now here’s a list of things I’m afraid may happen. Punting on entitlement Reform – As noted above, the wild card for any sort of genuine entitlement reform is Donald Trump. If he decides to to be President Santa Claus by appeasing various interest groups (like the previous GOPer in the White House), then reform will be dead. Simply stated, House and Senate Republicans will not push good changes without support from the White House. But that’s only a partial worst-case scenario. Trump may choose to be like the previous Republican President and actually expand entitlements (perhaps by borrowing a page from Elizabeth Warren’s playbook and expanding Social Security). If Trump decides to punt (or, gulp, make things worse), that has very grim implications. Reform will be dead for at least eight years (either because Trump gets reelected or because he’s replaced by a Democrat who also opposes reform) and the longer we wait to address the problem, the harder it will be to save America from a Greek fiscal future. A “Poison Pill” in tax reform – While there is a great opportunity to fix some of the biggest warts in the internal revenue code, I worry that lawmakers will include some bad revenue raisers to help “pay for” the good provisions. I don’t think there’s any danger (at least for 2017) of a value-added tax, but the plan from House Republicans includes a “border adjustable”/”destination based” tax on imports (known as a DBCFT) that is not only protectionist, but could eventually morph into a VAT. A smaller tax cut without a DBCFT would be better than a bigger tax cut with a DBCFT. An infrastructure boondoggle – It appears that some sort of infrastructure plan will be approved in 2017. I wrote last year to suggest three guidelines for the incoming Trump Administration on this issue, but I fear that this initiative will become a typical DC feeding frenzy. Lots of spending with no accountability. Italian bailout – If the inevitable Italian fiscal crisis occurs in 2017, the worst possible outcome would be a Greek-style bailout. That approach has several undesirable implications. It will a) exacerbate moral hazard by rewarding the investors who bought Italian bonds, b) it will enable Italian politicians to incur more debt, and c) it will enable the Italian people to continue thinking that big government is good because someone else is paying for it. To be sure, because there’s so much more debt involved, bailing out Italy will be much harder than bailing out Greece. But so long as the corrupt and venal IMF plays a role, it’s always prudent to assume the worst policy will be imposed. I hope all readers have a happy new year. And I hope. for the sake of America and the rest of the world, that the first half of today’s column is more accurate than the second half.